Background: In last decades, snake venoms have aroused great interest of the medicine due to the pathophysiological effects caused by their toxins. These include the phospholipases A2, low molecular weight proteins capable of causing haemorrhagic, myotoxic, inflammatory and neurotoxic effects after an ophidian accident. 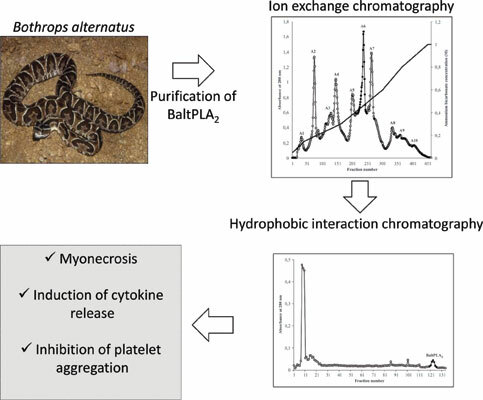 The present work describes the isolation and biochemical characterization of a new PLA2 isolated from the B. alternatus snake venom, which was named BaltPLA2. Method: The rapid and efficient purification of this toxin was performed using only two chromatography steps (anion exchange and hydrophobic chromatography). Results: BaltPLA2 is an acidic protein (pI 4.4) with an apparent molecular mass of 17000 (SDSPAGE) and 14074.74 Da (MALDI TOF/TOF). Analysis of fragments ion by MS / MS showed the following internal amino acid sequence SGVIICGEGTPCEK, which did not exhibit homology with other PLA2 from the same venom. BaltPLA2 is a catalytically active, which displayed an anticoagulant action, inhibition of platelet aggregation induced by epinephrine (~ 80%) and ADP (24%). BaltPLA2 also was able to induce myonecrosis and the release of cytokines (IL-10, IL-12 and TNF- α) in macrophages culture. Conclusion: The results presented in this work greatly contribute to a better understanding of the mechanism of enzymatic and pharmacological actions of PLA2s from snake venoms and they may contribute to its application in medical research. Bothrops alternatus, phospholipases A2, platelet aggregation, inflammation, snake venom, myonecrosis.